I found the red/pink clouds to match the red boat house so I thought this scene would make a nice photo. I’m starting to get a nice collection of photos with boat houses in them. Check them out here. This photo was taken as the same time period as this sunset picture. Stunning shot, great composition and colors…. Dette var et utrolig flott bilde!! Unni: Kult Ã¥ fÃ¥ feedback fra ei Nordkvinne! Tenkte litt pÃ¥ Ã¥ joine dere, men mÃ¥ finne en smart mÃ¥tte Ã¥ implementere det i bloggen..
Shaun: Thanks! This is another boatshed. There are tons of them around here. Jackie: Nice to see you around these parts 🙂 Thanks for the nice words! This is beautiful. 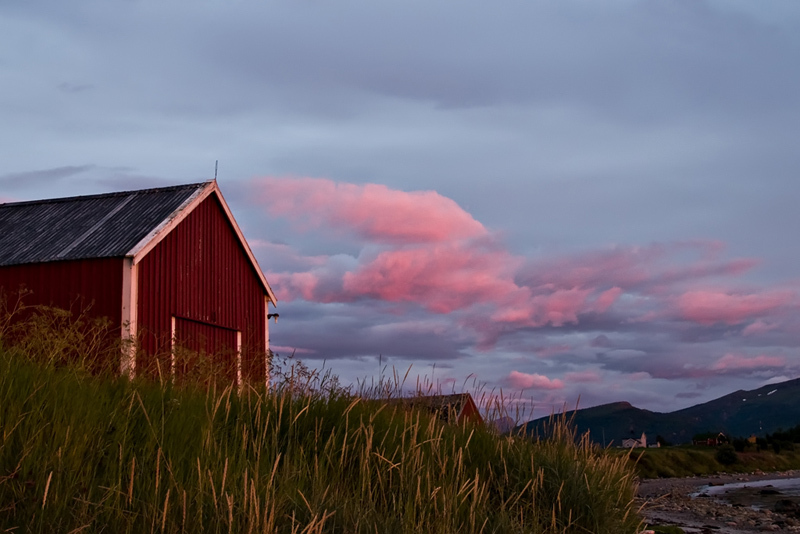 I love how the light makes the red of the barn have this deep glow, and the color of the clouds…you are an amazing photographer. Thomas, this is awesome. Excellent composition and I love the colors. this is so pretty. You should sell it as a desktop background.